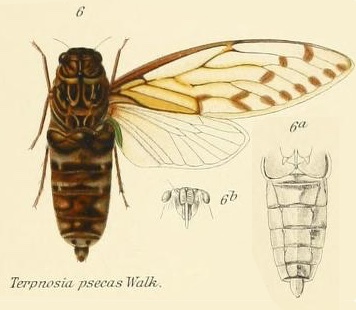 Terpnosia psecas (Walker, 1850) is a cicada found in India, Ceylon (Sri Lanka) and Java (Indonesia). Characters. — Head about as long as breadth between eyes, deflected anteriorly, front not prominent; pronotum distinctly shorter than mesonotum, its lateral margins sinuate, with the posterior angles moderately lobalety produced; abdomen in male longer than space between apex of head and base of cruciform elevation; tympanal coverings both narrower and shorter than tympanal cavities; opercula in male short and transverse, usually not or scarcely extending beyond base of abdomen; anterior femora spined beneath; tegmina and wings hyaline, the first usually more or less maculate, with eight apical areas, and the basal cell longer than broad; wings with six apical areas.